The Commonwealth of Virginia, as colorized in red on this map, is bounded by Maryland on the north, by North Carolina on the south, by the Atlantic Ocean on the east, and by Kentucky on the west. Virginia is bordered by West Virginia on the northwest, and by Tennessee on the southwest. The nation's capital, Washington, DC, lies to the north of Virginia. Virginia is the 37th largest state in the United States, and its land area is 39,594 square miles (102,548 square kilometers). Within the state's borders lie 41 independent cities and 95 counties, many named after places in England. This Virginia map site features road maps, topographical maps, and relief maps of Virginia. The detailed, scrollable road map displays Virginia counties, cities, and towns as well as Interstate, U.S., and Virginia state highways. The pannable, scalable Virginia street map can be zoomed in to show local streets and detailed imagery. to view a scalable Virginia road map. The detailed Virginia map and the regional Virginia map display cities, roads, rivers, and lakes as well as terrain features. The detailed map shows only the Commonwealth of Virginia, while the regional map shows Virginia and the surrounding region. Virginia's capital city is Richmond. Other major cities in Virginia include Virginia Beach, Norfolk, Chesapeake, Arlington, Newport News, Hampton, Alexandria, Portsmouth and Roanoke. In 2005, the population of Virginia was estimated at 7,564,327, which is about 191.1 people per square mile. In 2010, Virginia's population rose to 8,001,024 people. The state's Interstate Highways include I-64, I-81, I-85, and I-95, plus several auxiliary routes. Virginia was named in honor of Queen Elizabeth I of England, who was known as the "Virgin Queen". Eastern Virginia's coastal plain rises gradually to the Piedmont in central Virginia, and to the heavily forested Blue Ridge Mountains and rural Shenandoah Valley of western Virginia. This state, with its scenic Skyline Drive and many historic sites, is a popular tourist destination. Visitors can learn about Colonial America at Jamestown and Williamsburg, about the birth of the USA at Yorktown, Mount Vernon, and Monticello, and about the Civil War at numerous Civil War battlefield sites. For more Virginia travel and tourism information, visit the official Virginia tourism site and Virginia Atlas. This Virginia reference map shows major cities, roads, railroads, and physical features in Virginia. 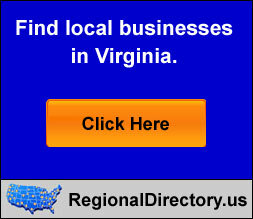 Several map publishing companies offer printed maps of Virginia. For example, Omni Resources offers several maps of Virginia that feature points of interest, airports, and parks, as well as selected local attractions and insets of major Virginia cities. Virginia-Map.org Editor, State Maps, PO Box 775, Barnegat, NJ 08005.